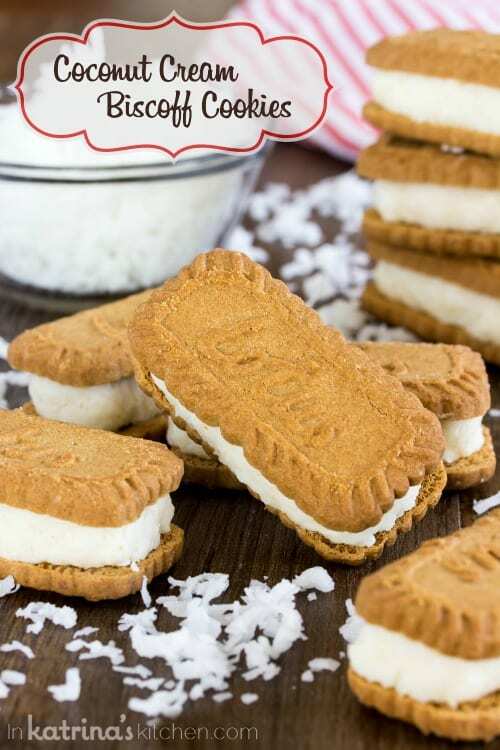 Creamy coconut filling sandwiched between crisp, caramelized Biscoff cookies- You won’t be able to put down these Coconut Cream Filled Biscoff Cookies. When I published The Biscoff Cookie and Spread Cookbook last winter I didn’t even come close to exhausting all of my recipe ideas, so I’m so excited to share these coconut filled cookies with you today! 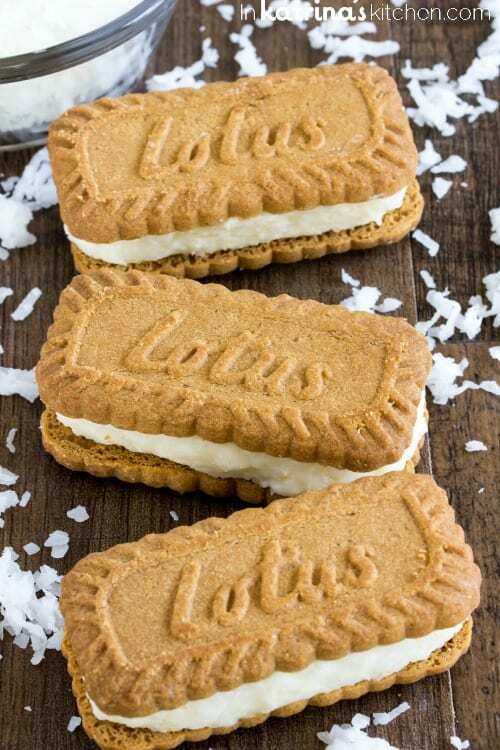 The creamy coconut is so delicious between the caramelized ginger cookies- you must try them! 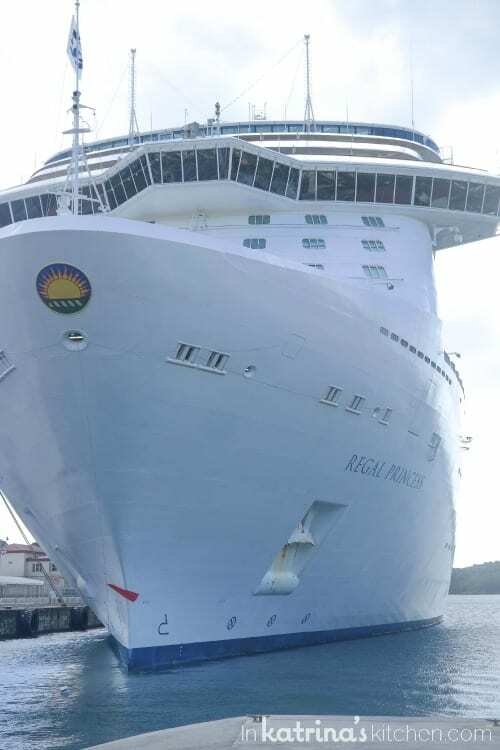 I’ve always enjoyed the taste of coconut but I think I got used to having fresh coconut almost every day while on my recent cruise aboard the Regal Princess. 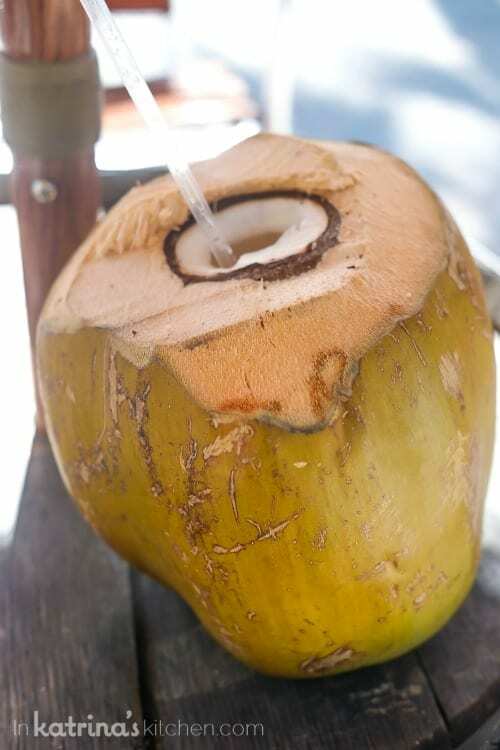 I rewarded every jog I took aboard the ship with a piña colada, and I certainly enjoyed fresh coconut milk on the islands. We had some technical difficulties so I’m sharing the recipe here, but please also stop by Dinners Dishes and Desserts and say hello. I’m helping Erin out while she’s away on an amazing family vacation of her own! 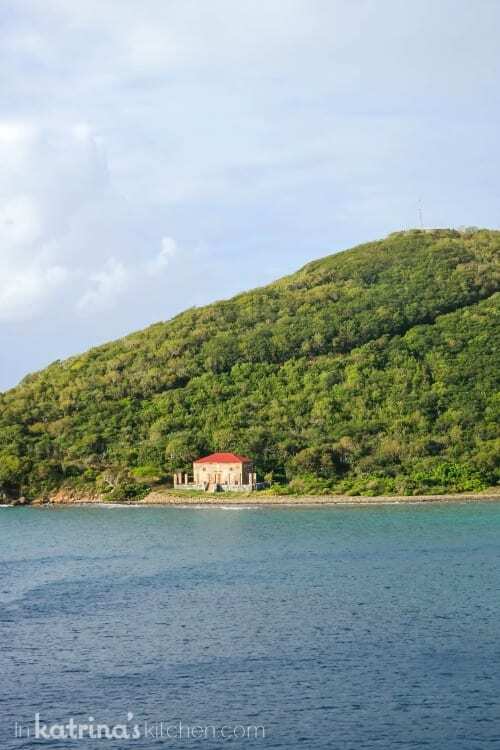 Following the recipe here I’ll share a few more pictures from our stop at St. Thomas US Virgin Islands. 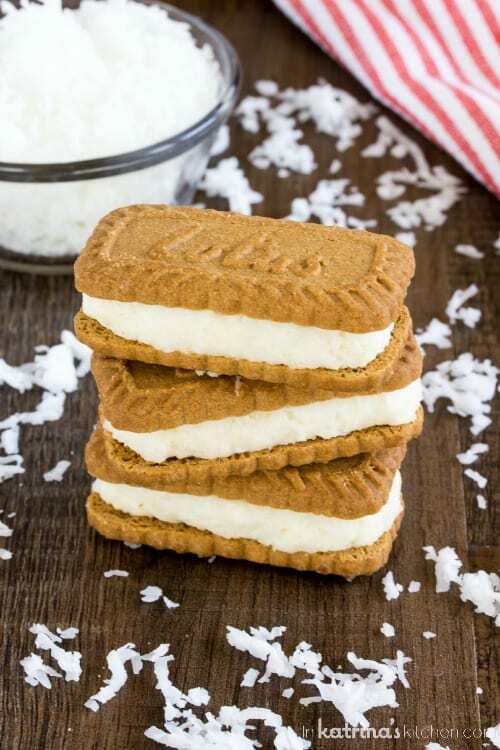 Creamy coconut filling sandwiched between crisp, caramelized Biscoff cookies- You won't be able to put down these Coconut Cream Filled Biscoff Cookies. In a large bowl using a hand-held mixer or stand mixer fitted with a paddle attachment, mix butter, vanilla, coconut, and powdered sugar until combined. Portion out the coconut cream on top of 15 Biscoff cookies, and top with remaining 15 cookies. I think my friend Kristen (Dine & Dish/pictured above with her sister) may have been the only person to beat my piña colada consumption! Since there’s no coconut like fresh island coconut I’ll just be munching on these delightful Coconut Cream Filled Biscoff Cookies until I make my way back there. I never got a chance to have fresh coconut in the Caribbean! I failed! But these cookies will surely make up for it, maybe. 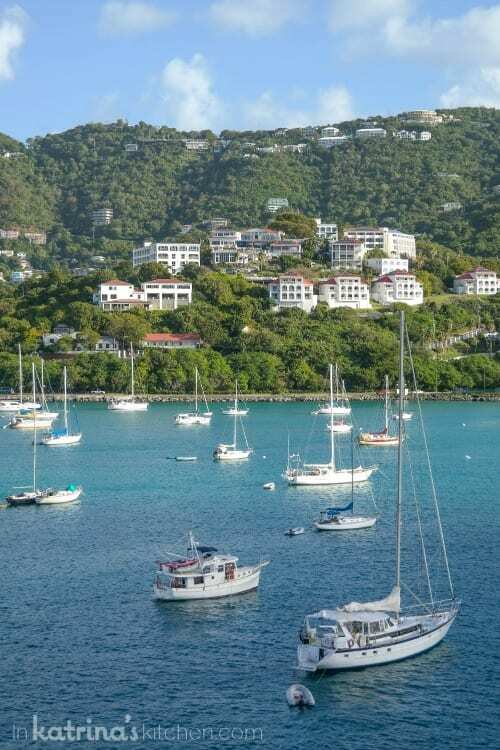 The photos you took in St. Thomas are so pretty! Love that photo of Kristen and Kathy!! Wait, coconut and Biscoff??? Okay, sign me up, that sounds like an incredible combination! And wow, fresh coconut and pina coladas? Now that is how to enjoy life post jog! This coconut cream sounds absolutely perfect for biscoff cookies! Yum! It sounds like you had an amazing vacation. Oh my, what a great recipe. Stuffing them with coconut cream is genius. Pinned. Oh yah, I want a dozen of these all for myself 🙂 Mmmm! Considering it snowed here this week – I am so envious of your warm weather escape!!!! So glad you enjoyed it! FABULOUS! I am obsessed with all things coconut lately. Seriously coconut oil, coconut body wash, coconut lotion, coconut cookies, coconut bars. AND NOW THESE. The coconut cream just makes it scream indulgent – I loves it. What a fun post and recipe. I’m currently coconut obsessed, too – but am totally wishing that I could have indulged in the fresh stuff with you in the Caribbean! We got snow today, so I’m definitely needing a bit of tropical goodness. These look amazing!! These look out of this world! I am loving the coconut cream! These cookies sound dreamy! I love that coconut cream and I fear if I made it I would just simply eat the whole bowl by the spoonful….haha. Fresh coconuts are the best aren’t they! 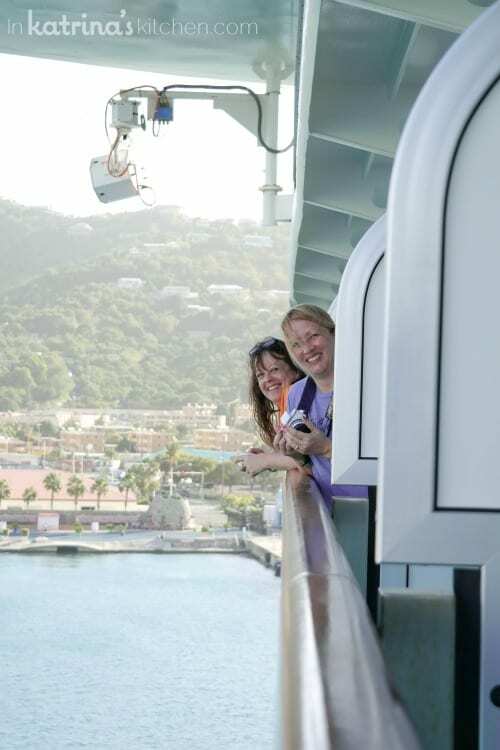 Beautiful cookies and I”m totally in love with those cruise photos! Oooo! 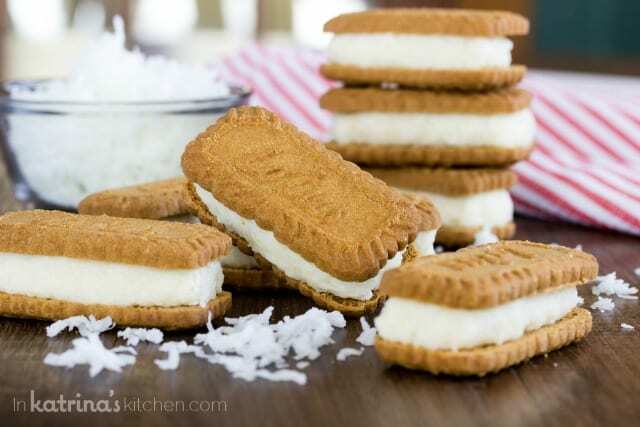 Biscoff and coconut sandwich cookies – crazy good idea! I’ll have to whip up a batch asap! What a crazy good looking concoction! Love these cookies! You are GENIUS with all things Biscoff!!! LOVE this new twist! This sounds like such a simple but delish dessert! OH my goodness… I can’t wait to put this between oatmeal cookies, lemon cookies & both white & chocolate oreo cookies !! Great idea! I’m glad you like it.